BREAKING: Cohen Reaches Plea Deal With Prosecutors - Joe.My.God. President Trump’s former personal attorney Michael Cohen has reached a plea deal on with federal prosecutors in New York, per ABC News’ George Stephanopoulos. The big question: It’s still unknown whether Cohen’s deal means he’ll be cooperating with federal investigators, including those in the Mueller investigation. 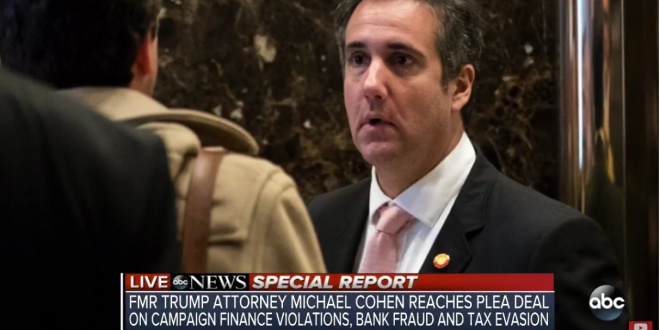 The reported deal comes after reports that federal investigators were looking into Cohen committed bank and tax fraud worth more than $20 million, according to a media report. The New York Times, citing anonymous sources, said authorities were focusing on loans obtained for taxi businesses owned by Cohen and his family. Investigators were also considering whether Cohen had violated campaign finance and other laws when he made financial arrangements to pay women to stay silent about alleged affairs with then-candidate Trump in 2016. Prosecutors had reportedly considered filing charges by the end of August.